The site of Tiruchchirapalli has been an important Hindu centre since Chola times due to its topographic position. The town is situated on the Cauvery River and is dominated by a huge granite rock that rises steeply above the town. Only a fragment of the great Nayaka fort remains, built on a circular plan with a ring of walls girding the great rock. On the summit of the rock there is a recent Ganesha temple, and on the way up there are two rock cut caves. 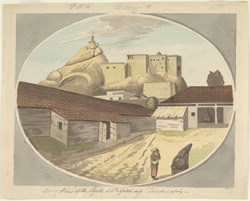 A small shrine to Ganesha is visible in the foreground of this drawing, with the fort in the background.